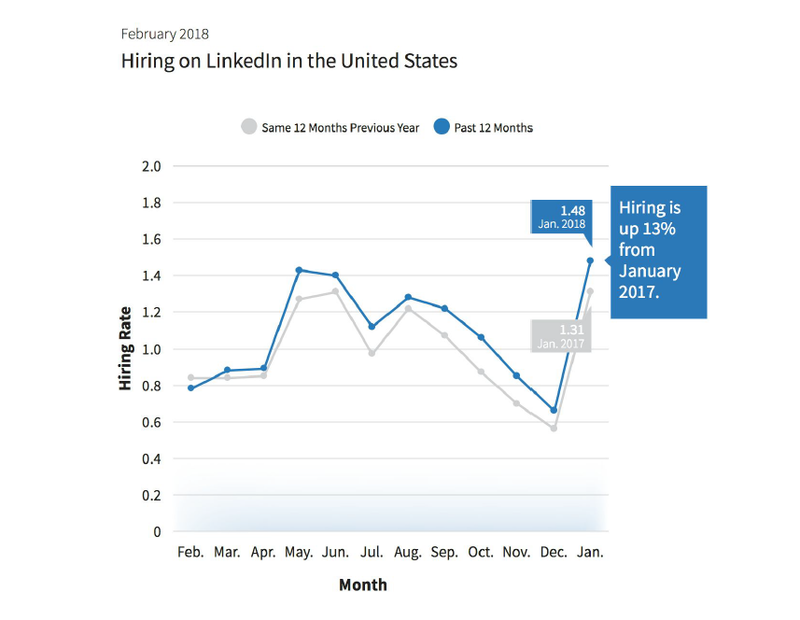 January was the strongest month for hiring in the U.S. since May, according to the LinkedIn Workforce Report. Hiring across the U.S. was 13 percent higher last month than a year earlier and 10.9 percent higher than in December, according to the seasonally adjusted data. LinkedIn said it was too early to tell whether the new tax bill caused the spike in hiring. “Continuing confidence among companies. They are hiring at a record pace,” Dan Roth, LinkedIn editor-in-chief, told CNBC’s “Squawk Box.” He added industries across the board showed growth in January. The sectors with the biggest year-over-year increases in January were manufacturing, up 15.5 percent, aerospace, automotive and transportation, up 13.2 percent, and financial services and insurance, up 12.5 percent. Demand for accountants has risen significantly in the past month, LinkedIn said. Seasonally adjusted hiring for accountants in January was up 16.3 percent from December, compared with 10.9 percent nationally. LinkedIn said the spike is likely attributable to the new tax bill rather than seasonal hiring due to the start of tax season. LinkedIn’s report is compiled from its more than 146 million user profiles in the U.S and 20,000 company profiles. LinkedIn has more than 11 million active job listings globally and has more than 3 million new job listings added in the U.S. every month. The Labor Department’s monthly employment data last Friday that showed nonfarm payrolls grew by 200,000. In addition, average hourly earnings were up 0.3 percent for the month of January.